Here is a vegetarian or vegan, gluten free, Ayurvedic Thanksgiving menu. You could create a vegetarian Thanksgiving or use these recipes to add variety to the traditional turkey dinner. Kasha: Thoroughly rinse the groats and discard water. In a medium saucepan, bring required water to a boil. Add rinsed groats. Cover. Reduce heat to low and cook groats for 20 minutes until the water is absorbed and the groats are fluffy. 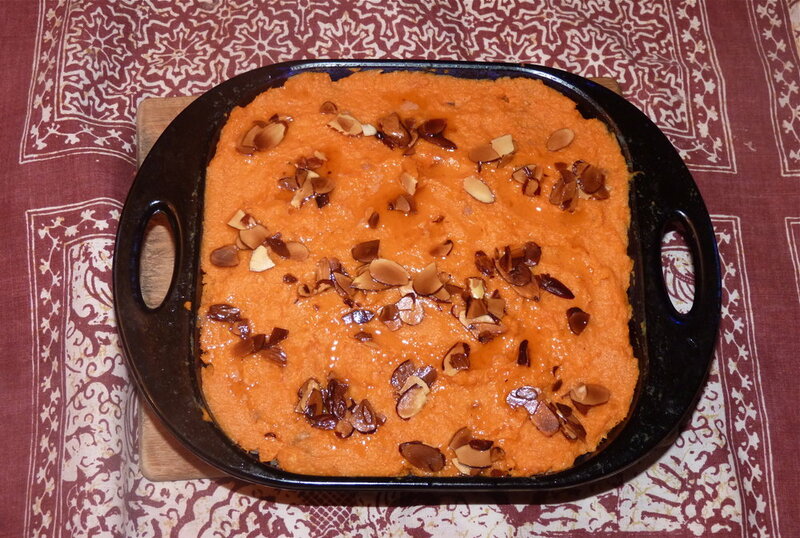 Sweet-Potato Puree: Prick sweet potatoes with a fork and bake in oven at 400 degrees for 50 minutes to an hour. Remove and discard skins. In a large mixing bowl, mash sweet potatoes. Add vegetable broth, dry ginger powder and half the ghee. Add a little salt but not too much, as the garlic sauce is quite salty already. Add pepper to taste. Garlic Sauce: In a small bowl, blend tamari with olive oil and garlic. Combine the three parts of the recipe: spoon kasha into a serving dish; drizzle with garlic sauce. Top with sweet potato mixture. Garnish: Fry the almonds in ghee until golden. Distribute the almonds over the top and pour on the hot ghee. Serve hot. Lightly toast the nuts in a pan on the stovetop, stirring with tongs. After 2-3 minutes, add olive oil to the pan and allow it to heat up. Add chopped greens to pan, and sprinkle with salt. Cover. Cook greens until tender, stirring occasionally. Add 1-2 Tbsp. of water if needed. Use tongs to clear a space in center of the pan and add minced garlic in a single layer. Cook garlic about 30 seconds, then mix it up with the kale & nuts. Salt to taste. Serve with lemon wedges so guests can add lemon as desired. Preheat oven to 200°C. Lightly grease a large roasting pan. Cut the potatoes in half lengthways and arrange in the pan. Drizzle the oil over the potatoes then sprinkle the spices over them. Turn to coat the potatoes. Roast, turning occasionally, for 45-50 minutes or until golden and tender. Remove from oven. 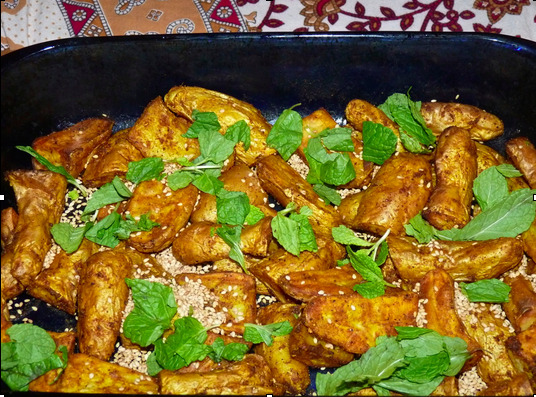 Place the potatoes on a serving platter, Sprinkle with sesame seeds and mint. Method: Blend ingredients, serve with the potatoes. Place pumpkin on a chopping board and cut into slices.Remove seeds and fibre and discard. Peel the thick skin off, removing all of the hard and thick skin. Cut flesh into small, 2 cm. cubes. Heat ghee or oil in a heavy based pan. Add pumpkin and stir fry for a minute. Add the coconut milk and simmer until flesh is soft. 10-15 minutes. Fry the coconut in a clean pan, on low heat, until there is a nice aroma of coconut. Returning to cooked, soft pumpkin, turn the heat off. Mash it well, using a potato masher or back of a spoon. Add sugar and cardamom seeds to the pumpkin mash and stir fry on medium heat until liquid dries up, ghee or oil separates and pumpkin looks shiny and has a mashed potato consistency. Add most of the almonds, saving a little for garnish, all the coconut and raisins. Transfer to serving dish and decorate with almond. Put washed cranberries and washed chopped apples in heavy bottomed pan. Grate 1tsp of the orange peel and add. Now squeeze the orange and add the juice. Bring to boil and simmer, stirring frequently to prevent sticking and adding water as needed. Once it is simmering, add sugar and raisins. In a small frying pan, melt the ghee, add cumin seeds and chilies and fry until they darken a shade. Now add chopped ginger and cinnamon and fry until the ginger is browned. When the chutney is almost cooked, add the chopped nuts.